Ogre Sixth Edition has arrived and we wanted to launch it with a bang! So we shared our enthusiasm with stores around the country that are participating in our #PlayOgre Launch Event by gifting them with a Launch Kit! These kits include tons of great giveaways like dice and counter sheets, and even a demo game. Now all we need is you! 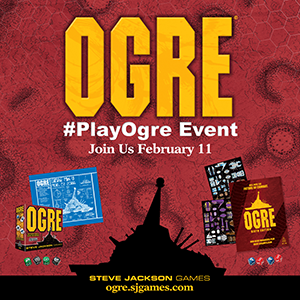 Head to your friendly local game store on Saturday, February 11, play Ogre Sixth Edition, post pics of yourself playing to social media, and tag your store! Not only will you have a chance to take part in post-apocalyptic, AI-fueled futuristic warfare, you'll be entered in our weekly contest. So stop by your local shop, play some Ogre, and get some awesome swag. Check this list of stores to see if your favorite location is participating, and join us February 11 for the game day!